Size 8 - $69.99 Only 7 left! Can you blame him? Peter Parker was merely 15 years old when he made his first superhero suit. He didn't have any help making it and he had no experience in sewing. Aunt May definitely wouldn't be helping him, that's for sure! So, he had to make everything himself, so it's not really a big surprise that the original Spider-Man suit is quite as suave as it could be. Well, the good news is that Peter, and your child, no longer have to go it alone when it comes to perfecting some superhero style! 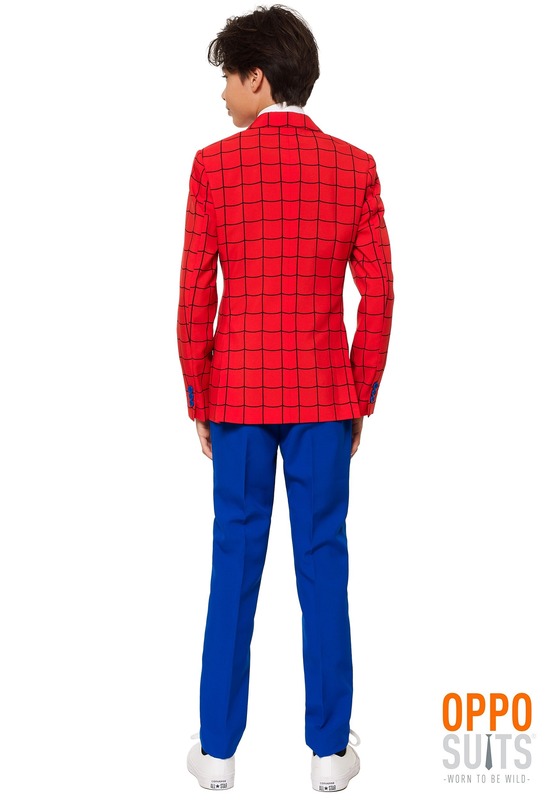 The fine designers from Opposuits have decided to help ol' Spidey out and they've made a great suit that's perfect situations when Spider-Man needs to look dapper! 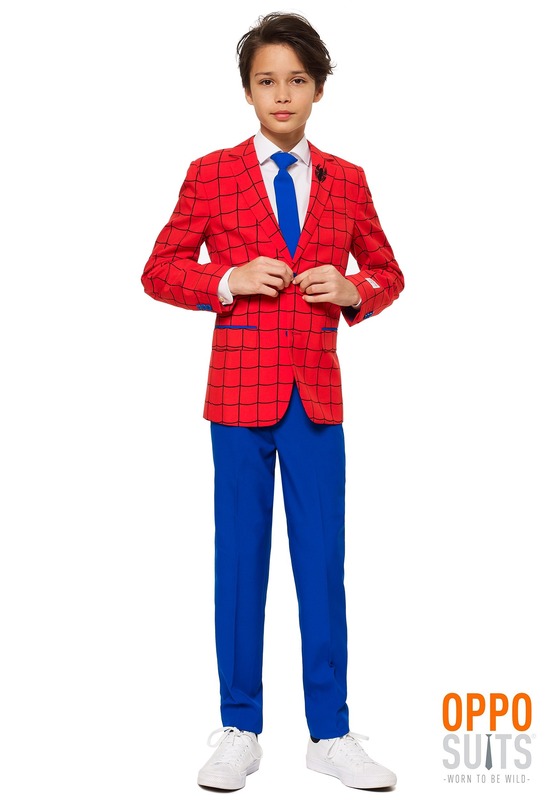 This Boy's Spider-Man suit combines the classic look of Spidey's suit with a dapper suit style, perfect for any occasion that requires an extra splash of class. This officially licensed suit comes with 3 pieces, including a jacket, tie, and pants. The jacket is bright red with a spiderweb pattern along the exterior. It's fully lined and has faux pocket flaps on the sides. The pants are bright blue to mimic the look of Spider-Man's jumpsuit. It has a zip fly and a button top for fitting. Finishing piece to this outfit is the tie, which is a clip-on style. No tying required for it! The tie matches the pants for a handsome look that will have your young one looking like a suave superhero. The next time Peter Parker needs a look that's both heroic and stylish, he'll no doubt be wearing this Spider-Man suit. Of course, your young comic book fan will also look pretty charming when they suit up in this stylish 3-piece suit. No web-slinging needed at all!